The concept of an “exorcism” seems arcane in our modern world. Very few Christians today are well versed in the ancient rituals of the Catholic Church. From popular culture we think of spine-chilling horror movies such as “The Exorcist” which caused a generation of moviegoers to think that evil spirits only appear as ghoulish monsters. 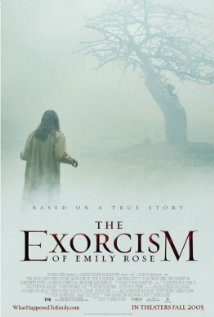 “The Exorcism of Emily Rose” is loosely based on a true story about a young college student who experiences a demonic possession, and a priest who attempts to save her life. Emily Rose (Jennifer Carpenter) grew up on a small Midwestern farm. There is nothing in this story that suggests that her family was anything but ordinary. She was a bright young woman reared in a family of faith who dreamed of attending college and starting a career. To her family’s delight, she is given the opportunity to go away to college, but it is here that her life takes a dramatic turn. She begins to hear voices in the night, voices that leave her with feelings of despair and often terror. To the school counselors, these are classic symptoms of mental illness. To her priest, these voices suggest something more evil. Emily’s family turns to their priest, Father Moore (Tom Wilkinson), to be present during one of her psychotic episodes. While not as dramatic as “The Exorcist”, what Emily is experiencing is beyond anything human. What transpires over the next few weeks is a deepening sense of hopelessness, a family in deep pain, and a priest turning to his deepest faith to understand how to cast out demons. Within weeks, Emily can take the pain no longer and she dies. The real story of “The Exorcism of Emily Rose” is not what happens to her, but rather what happens to everyone after her death. The Catholic Church brings in their legal team headed by a upwardly mobile young attorney, Erin Bruner (Laura Linney). At stake is now the life of Father Moore who is accused by the State of being negligent to Emily, leading to her death. From the Church’s perspective, the leaders just want this case to go away and be settled out of court. Because of its high profile in the media, Laura Linney sees this as a career builder. For Father Moore, he wants a trial so he can tell Emily’s story and let the world know that she wasn’t crazy. As the story unfolds, the one person that ultimately does come to believe Father Moore’s story is his lawyer, Ms. Linney. During the trial, she too, experiences the presence of evil in her life, and she has to struggle with the concept of outside forces greater than herself or greater than what we can see or touch having a destructive influence on us. Are we the masters of our own universe? Or, are there things in the “spiritual world” from which we all need protection? We won’t spoil the ending by telling you what the jury decides. From the perspective of the film-viewing jury, though, Emily Rose’s story would make anyone think twice about what we know about the demonic influences around us - and sometimes within us. Have you ever experienced an evil that imposed itself upon you or someone you love? How did you “exorcise” it? In this instance do you believe evil won? Why or why not? Do you believe our world is becoming more accepting of spiritual things, including demonic powers, or less accepting? On what basis do you make your opinion? In the Bible, Jesus has no difficulty “casting out” or “exorcising” a demon, since He is all-powerful. Yet Jesus explains to His disciples that some demonic powers are more difficult for us to exorcise than others. What do you believe about the power of God to deal with evil? Posted on June 1, 2011 by Cinema In Focus and filed under 3 STARS, CHALLENGING and tagged 3 STARS CHALLENGING PG-13 RATED 2005 CRIME DRAMA HORROR.